There was an announcement at Google I/O last week that has already been almost forgotten: the Nexus Q. In general, it looks like an interesting product, but the main problem with the device is the price point. There are a number of devices on the market that have similar features, but are far less expensive than the $300 tag on the Q. Here's how low interest is in the Nexus Q - it's an unreleased product that's selling for less on eBay (~$250) than the official preorder list price ($300). But, what if the Nexus Q could do more than stream media? What if it could run a more complete version of Android with games and apps? Certainly that could make the $300 price tag look a bit more acceptable. Well, that is now possible. 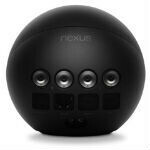 Some claim that the process to hack the Nexus Q for higher functions is pretty advanced, but really if you've manually unlocked and rooted an Android device before, it's pretty standard. Maybe the one-click rooters should study up before trying though. Still, it's pretty impressive what developer kornyone was able to do in such a short time. He unlocked and rooted the Nexus Q, then side-loaded a launcher, Chrome, Google Apps, and some other goodies like Netflix, all of which seem to work just fine. Essentially, this changes the Nexus Q from the "social streaming media player" it's marketed as into a real Android-powered mini-computer. The work is still quite early, but should only get better from here. The price make it unattractive . Why google wants to make it in the US ? I respect Google decision to make the device in the USA..... Bring more jobs back home. I will gladly pay the price knowing that it is US made.... but I am holding off for features get unlocked by guys like this. But wouldnt you want your homeland companies to bring jobs back to your country? I think the price for this is just right. It is high enough to warrant attention for being too costly for the average consumer, which it is not actually for. It is also very very open which allows a regular coder or programmer to turn it into something else. That was the whole purpose of the product to give the public a device with great potential and see what they do with it. Similar to how an entire community has been spawned from the kinect. Its just smart product play as I am sure something will be out later that has many advantages people will fawn over in due time.